I hate these words. I often feel like nobody really gets it. That no one really understands. I’m pretty sure most people don’t. That battle ground has a history: years of struggle, an occupational therapy diagnosis of sensory aversion, and a diagnosis of autism with restrictive and repetitive behaviors. My kid actually started loosing significant weight at age 2 due to him not eating anything I was fixing. Then, the doctor suggested feeding him whatever he would actually eat. And lots of it. So I did. Then we fell into the “only eating a handful of things” trap. All of which had the exact same texture. My friends suggest we go to a kid friendly place so my son can eat. I laugh. They mean well, but that won’t help. Now, my son eats between 5-15 foods, none of which are on any menu. Recently he asked the guy at Chicken Express for peanut butter crackers. I don’t think he really heard him, but my husband and I had a good laugh. I have gotten really good at bringing his food to restaurants. I used to order an extra plate and act like I’m going to share my food just so we don’t stand out. Nowadays, I don’t even care. And sometimes turkey bacon. If I’m lucky. One time, I started full on crying when I say a two year old eating a banana and I realized my kid never had one. I’ve longed for him to eat fresh fruit, veggies, heck ice cream or candy…. seriously anything. 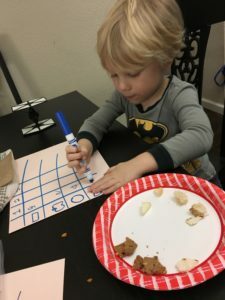 We started our OT therapy journey right after our son turned 4. 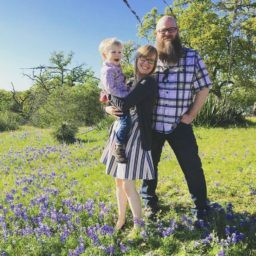 We have been wanting to get private therapy for two years, but due to insurance issues and lack of a diagnosis, we had to wait. I really expected therapy to just fix him. I had read many books and tried multiple approaches and nothing made significant changes. 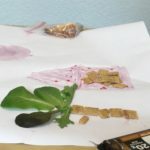 After our first few visits, the therapist played a game involving food. She got him to eat a French fry. That’s right. I just waited months, nay years, to pay someone to convince my 4 year old to eat a stupid French fry. He says he doesn’t like it. I feel there is so much irony in this. Since then, we have been playing the same game at home. It’s nice to get him to try new foods. Tiny bites really. And it doesn’t work every time. It takes so much effort on our part to be both encouraging and persistent. 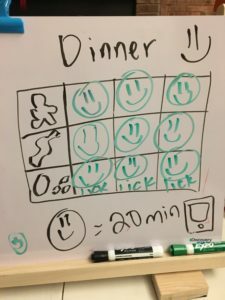 Food Game: Earn a smiley face for each, lick, bite, nibble of a new food. And he has the option to spit it out. The goal is just to touch his mouth with a new sensory experience. Our reward: 20 minutes of Ipad time. Yes, we play with our food. All in an effort to provide new sensory experiences. Food Game Round 2: A little more self directed. He wanted to draw his own smiley faces. One of my best moments was when I realized he likes tea. I can take him out to coffee shops or Starbucks, because green tea is his favorite. But he just doesn’t like French fries! I would love to just eat, drink and be merry. Until then, he will eat the same damn things. Food is food, and calories are calories. We will play games with our food. And I’ll pay a therapist to get my kid to try even the most kid friendly type of foods. I’ll try really hard to remember that my child is more than his self restrictive diet. He is funny, goofy, full of energy and lights up my life with his joy. And we can always just go to Starbucks. Because my kid is just too cool for French fries. My guy does a really fun thing where if i try to get him to eat something he “doesn’t like” he will vomit it all over the table? So, um, this makes me think it’s “REAL”…Ya know? Our son is 11. He has never used a utensil because none of his foods require it. I feel you so much. I wish my kid was a “picky eater”. But he is isn’t . He is an exact eater. He has never eaten a price of fruit, vegetable, meat. Never eaten ice cream or cake, yogurt, no chicken nuggets but had A French Fry (1). However we were fortunate to get him hooked on a high protein drink at age 2nthat provide all of the basics. He convinced his self at age 5 to take a fish oil supplement because he read an article that it will help with his stammer. So he takes that and an elderberrry multi vitamin daily. Thank you! It’s good to know I’m not the only one. Thanks for sharing. My 4 year old has a feeding tube to keep her alive. She will taste many different foods, but eating is a whole other story. So, we keep encouraging her every day to taste, sip, and on a great day spoon a pea size amount of purée into her mouth. Kay, I cannot even begin to understand your struggle. My son’s food aversions pale in comparison. Thank you for sharing. It’s a good reminder that our children are more valuable than the tasks they can or cannot accomplish.